Over the years I’ve heard lots of yoga teachers, myself included, say something like “Breathe through your skin.” Yogic poetic license, I assumed – an image of receptivity and a reminder that the whole body participates in breathing. Salamanders, sure — they breathe through their skin. Humans, not so much. So I thought. Recently, though, I’ve been teaching anatomy and physiology at a school for estheticians, so I’ve had to brush up on my skin physiology. Turns out the skin actually does breathe. In a way. Skin cells absorb oxygen from, and release carbon dioxide into, the surrounding air. This has been known for a long time — since 1851, in fact – although it was news to me. The amount of oxygen that diffuses through your skin is negligible, a tiny percentage of what you absorb through your lungs. However, it’s enough to supply a significant amount of the oxygen needs of your skin’s surface layer, the epidermis. The epidermis is like a thin coat of paint on the much thicker, deeper layer of the skin called the dermis. 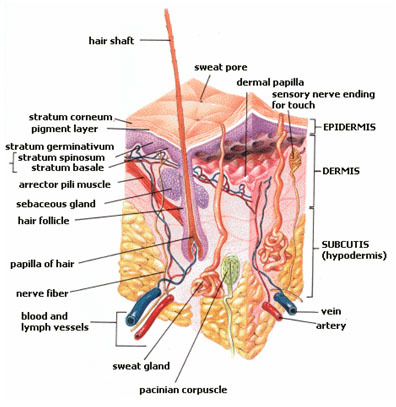 The dermis has a blood supply, but the epidermis doesn’t. Whatever oxygen and nutrients the epidermis receives from the blood are a result of spillover from the dermis, making the oxygen it absorbs from the atmosphere a vital supplement. You can influence blood supply to your skin indirectly. For instance, when you practice asana and your muscles heat up, more blood flows to the skin to dissipate the heat. However, I doubt there’s much you can do to increase the oxygen you skin absorbs from the atmosphere, since that relies on passive diffusion. Regardless, it’s still a nice image. Try it the next time you’re sitting. Imagine your skin softening and becoming porous. As you breathe in, visualize the entire surface of your skin – even the palms of your hands and the soles of your feet – opening to receive the breath. As you breathe out, imagine your skin softening still further, draping itself like a thin silk scarf over your muscles and bones. Try not to strain. The image is a reminder that your entire body participates in breathing, but you don’t have to inflate yourself like a balloon. Your skin shouldn’t become taut as you breathe in. Just let it be receptive.